At the pleasure end of an official trip, I, along with my adventurous friend of many years, Asif Rehman, chose to visit the famous St Peter’s Basilica to round off a well-spent week in Rome. As we neared the Vatican enclave, we could see a queue that was over a mile long, well beyond the walls of the 44-hectare city-state, and spilling into Rome. It was a wonder that such a large multitude had woken up so early on a Sunday to visit the basilica (an important church that enjoys a privileged status, I learnt). Looking at the slow moving queue, we were rather disappointed but several tourists encouraged us to stick around and, assured us that we would be at the gates in no time. 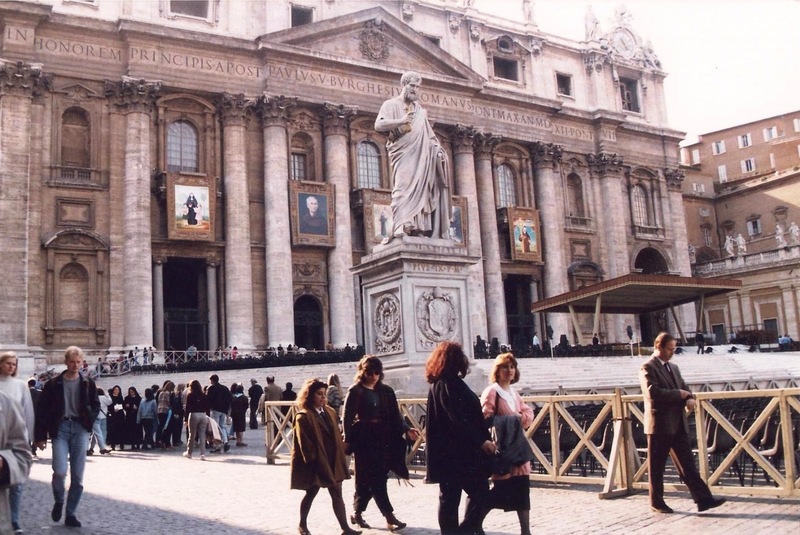 An hour later, we arrived at St Peter’s Square – which is actually elliptical – outlined by a monumental colonnade adorned with 140 statues of various Christian saints, designed by the Renaissance master Lorenzo Bernini. In the centre of the Square is an obelisk dating back to 13th century BC Egypt, which was brought to Rome by the plundering Emperor Caligula. 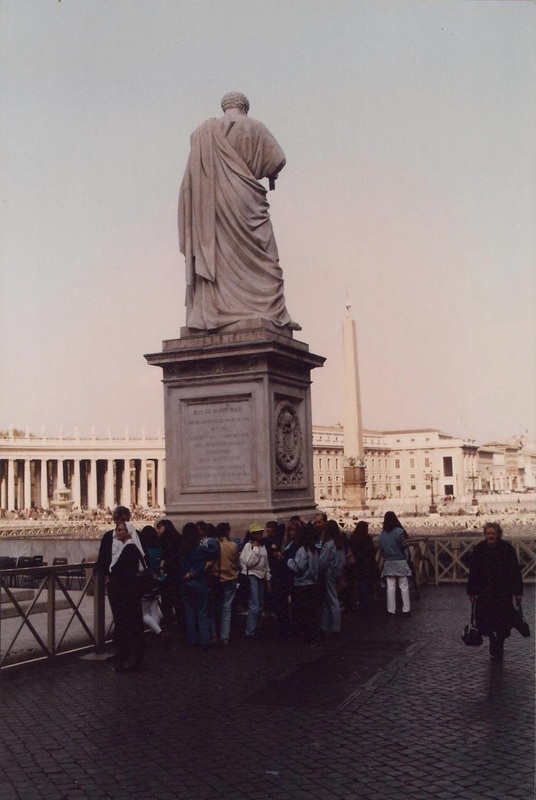 The obelisk was moved a few hundred metres to its present location in 1585 and marks the location where St Peter, one of the twelve disciples of Christ, was crucified in 67 AD. The ruling Emperor Nero had not taken to St Peter’s religious ministry in Rome with forbearance, and the dislike worsened after the Great Fire which was somehow blamed on the Christians. Today, the obelisk is revered for having been a ‘witness’ to the martyrdom of the revered apostle, who is also considered as Christianity’s first Pope. Interestingly, the obelisk also serves as a huge sundial pointer, with the hour markers indicated by white discs on the cobblestone pavement. While we watched, the Square was getting thronged by tourists and the faithful, both young and old. Everyone had a camera and a festive mood prevailed as people posed against fountains and statues. 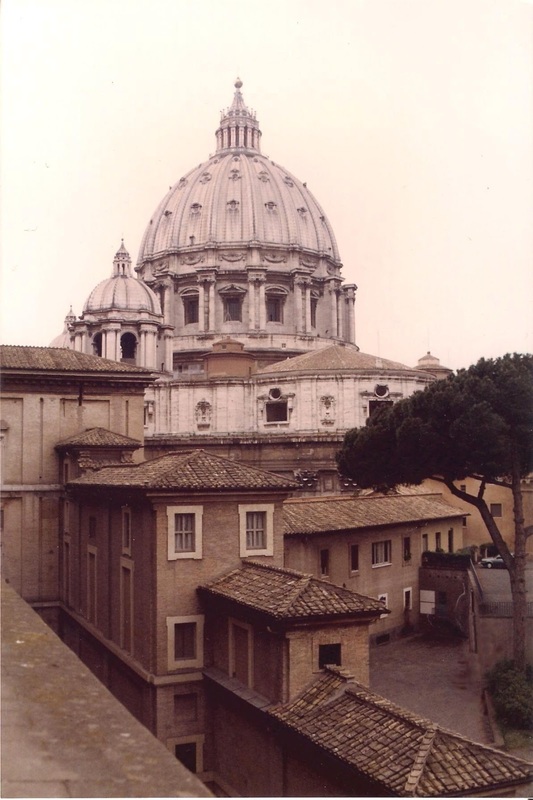 The further away one went from the basilica, the more prominent became the magnificent dome, whose design incorporates the masterly touch of Michelangelo who also worked on it for some years. Unfortunately, due to an amended basilica floor plan patterned on the Latin cross (which has one arm longer than others), the nave or the central hall was lengthened, causing the façade to obscure the dome as one gets closer. A somewhat similar phenomenon can also be noted in our Badshahi Mosque at Lahore and the Jama Mosque at Delhi, where the façade rises too high in relation to the dome. I may mention that so far as I have seen, the Taj Mahal at Agra seems to have got the proportions just right, and the delicate dome can be happily viewed from far or near alike. 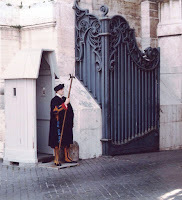 After purveying the Square, as we were about to enter the basilica, our eyes caught sight of the colourfully costumed Swiss Guards armed with the medieval halberds, guarding the entrance that leads to the inner sanctum of the Vatican. 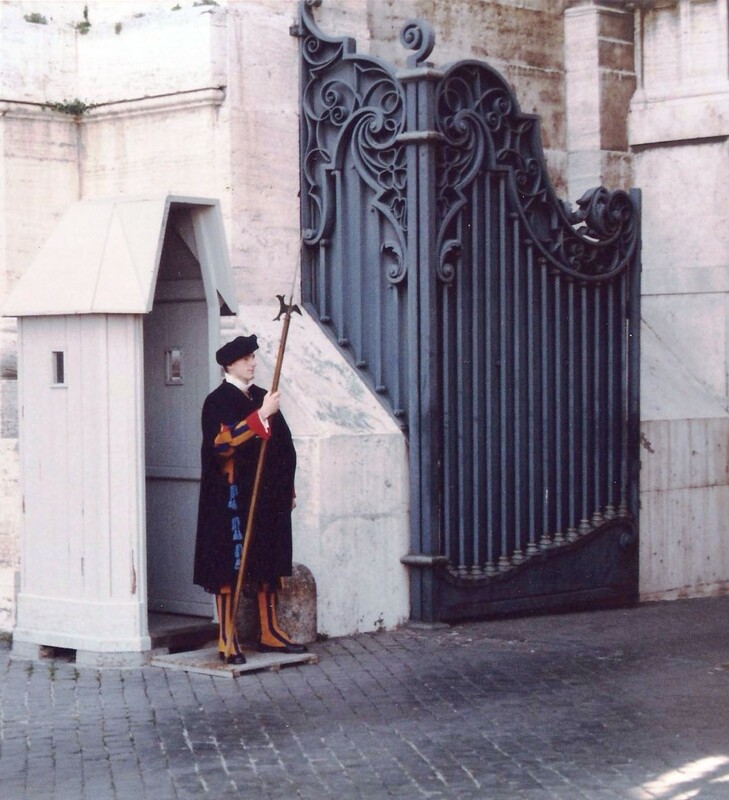 Dating back to the time when the present basilica’s construction started on the site of the older one in 1506, the guards have continued to perform ceremonial as well as personal security duties for the pontiff. Hidden from the view of the public are their SIG 220 pistols that are standard issue, ever since the attack on Pope John Paul II in 1981. The 135-odd Swiss Guards (actually Swiss mercenaries) are aptly called members of the world’s smallest army of the world’s smallest state. They are said to be the most photographed ‘item’ at St Peter’s! Just outside the entrance to the basilica, we noticed a flyer pasted on the side which suggested that visitors – both genders included – might like to suitably cover their legs and shoulders. In the modesty-abhorring Europe of today, this notice seemed to have little meaning as we were soon to discover, much to our astonishment. Not at all familiar with the rituals and symbolism of a church, we were overawed by the works of art, ranging from the images inside the dome on top, right down to the mosaics on the floor. Memorial statuary in marble and bronze, baptismal fonts, numerous altars and chapels dedicated to apostles, saints and popes took up every part of the basilica. Next to the entrance door on the right side is the famous Pietà sculpted by Michelangelo, a masterpiece carved from a single boulder of the finest white marble. It shows Mary grieving over the dead body of Christ with heart-rending composure. Graceful as she looks, Mary seems to have been depicted as rather young to be the mother of a thirty-something Jesus, I thought. Rambling through the nave of the basilica without the corresponding historical knowledge of Catholic Christianity, we simply appreciated the artistry and wondered at the immense toil that must have gone into completing this great church commissioned by Pope Julius II, a patron of arts and many building projects. It was formally consecrated after 120 years in 1626, having been overseen by numerous teams of popes, architects, sculptors and artists during its long period of construction. While I am at it, I must share some trivia with the readers that St Peter’s is not a cathedral as it does not have a bishop to head it, even though the Pope holds Mass and works in its precincts. Contrary to what one might believe, St Peter’s is not even the ‘mother church’ of Roman Catholicism, for that honour officially goes to St John Lateran in Rome, whose bishop the Pope actually is: justifiably so, as St John’s happens to be the oldest church of Rome, parts of which date back to 318 AD. Of course, association with the papacy and the focus of pilgrimage confer the title of the holiest church on none, but St Peter’s. After spending about an hour in the basilica, we decided to check what was going on at the Sacrament of Confession, where a number of worshippers had lined up in front of wooden booths with small peephole windows. We learnt that here, one could confess and be instantly relieved of his or her sins, with the assistance of the Fathers on duty. Asif and I joked with each other that, were we to go for a thorough cleansing, it would take up the better part of the day so it was wise to give others a chance! Not having enough time, we decided on a brisk walk-through tour of the nearby Vatican Library, instead of the gloomy underground crypt where former popes and other important personages are buried. The well-lit and profusely decorated library is a vast repository of over a million books and 75,000 historical manuscripts. Vatican scholars in their standard religious attire could be seen busy with their research work, apparently undisturbed by tourists like us who trundled around with clicking cameras. “Silenzio!” echoed a gentle command uttered by the library attendant each time the tourists’ loud whispers tended to turn into a cacophony. A visit to the adjacent Sistine Chapel could not be undertaken due to its closure for renovation work; instead, I bought a book on the Sistine Chapel from a nearby bookstand. Informative though it was, I found it appalling that a hallowed place of worship would put up with the rather inappropriate depiction of unclad figures, all in the name of art or so-called liberalism. After all, much more than legs and shoulders were on display! Finally, as we took leave of Vatican and looked back at the huge basilica, we could not help but be amazed at the immense diversity in the places of worship, ranging from the uncomplicated and austere, yet glorious Ka’aba, to the lavishly adorned and ornate St Peter’s. Man has a way of getting to God…. and the wonder is that He loves it anyhow! This article was published in the daily newspaper The News International under the title, "Under Bernini's Canopy" on 22 January 2012.